Sarah Nader- snader@shawmedia.com Girls on the Run members, Candace Casilao (left), 11, of Lake in the Hills, Zaina Mohammed, 8, of Lake in the Hills and Hannah Hawkins, 10, of Huntley complete a practice 5K run Tuesday, May 3, 2016 in Lake in the Hills in preparation for the official 5k race they do at the end of the program. Girls on the Run is a 12 week program that helps inspire girls to be joyful, healthy and confident while creatively integrating running. Sarah Nader- snader@shawmedia.com Girls on the Run member Payton Serpe, 8, of Huntley (center) starts a practice 5K run Tuesday, May 3, 2016 in Lake in the Hills in preparation for the official 5k race they do at the end of the program. Girls on the Run is a 12 week program that helps inspire girls to be joyful, healthy and confident while creatively integrating running. 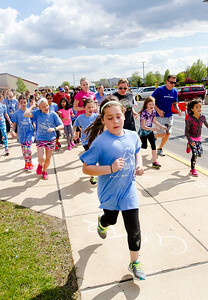 Girls on the Run members, Candace Casilao (left), 11, of Lake in the Hills, Zaina Mohammed, 8, of Lake in the Hills and Hannah Hawkins, 10, of Huntley complete a practice 5K run Tuesday, May 3, 2016 in Lake in the Hills in preparation for the official 5k race they do at the end of the program. Girls on the Run is a 12 week program that helps inspire girls to be joyful, healthy and confident while creatively integrating running.